TWC Commissioner Representing Labor Julian Alvarez and Commissioner Representing the Public Robert D. Thomas present the grant check to Donna ISD. 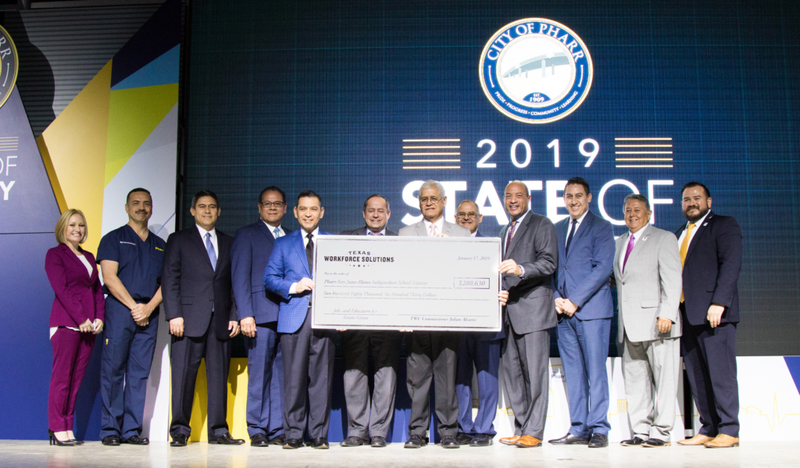 Donna ISD, Pharr-San Juan-Alamo ISD, Raymondville ISD are all recent recipients of Jobs and Education for Texas grants fro the Texas Workforce Commission. The schools will use the grants to purchase and install equipment necessary to train 779 students for careers in high-demand occupations. These include welding fabrication and emergency medical services. Grant totals include $271,472 to Raymondville ISD, $208,383 to Donna ISD and $280,630 to Pharr-San Juan-Alamo ISD. The grants will benefit students in the Workforce Solutions Lower Rio Grande Valley area. TWC Commissioner Representing Labor Julian Alvarez and Commissioner Representing the Public Robert D. Thomas present the grant check to Pharr-San Juan-Alamo ISD.